Where will you, your blanket, your picnic basket, and your best buds go over the summer of 2017? And what will you watch? A devoted film fan can slip into a roof'd theater on any day of the year, even if it is pouring fiercely out, even if there is extreme fog, or even when the temperatures top 100 degrees. But a lover of the outdoor movie experience, which typically involves a blanket, a picnic basket (or, more accurately, a few well-loved cloth shopping bags), and the enjoyment of entertainment as evening falls, has a much shorter window for her particular pursuit. That warm-weather window typically starts around late April, and, at least in Southern California, wraps right around Halloween, which is the unofficial close of summertime 'round these parts. 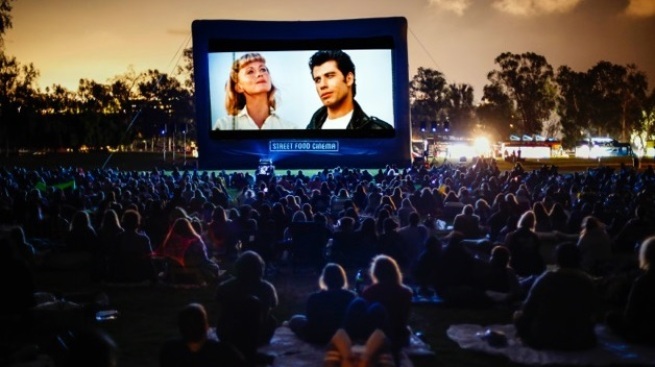 And that seasonal window will soon open again for the ever-popular Street Food Cinema, a bounce-around-town happening that plays a host of beloved films in park- and park-like settings over a glorious five-month stretch. And what will fill that glorious five-month stretch was just revealed on Wednesday, March 1, meaning this: Summer's start is on the way, SoCalers. Some highlights? "Star Wars: The Force Awakens" will cross light sabers at Los Angeles State Historic Park on Saturday, May 13, "Back to the Future" will travel to Verdugo Park in Glendale on Saturday, May 27, and "Hocus Pocus" casts a spell at Syd Kronenthal Park in Culver City on Saturday, June 17. "Silence of the Lambs" wraps it all up, just a few days ahead of Halloween, at Poinsettia Rec Park in West Hollywood. As is tradition, the started-in-2012 event will include food trucks, musical delights, and other special goings-on, in addition to the showing of the main feature. Want to eye the whole get-out, watch-a-flick list? It's up and live now.